Prior to the release of Pokémon Sun and Pokémon Moon, for months we ran a feature series entitled Who’s That Pokémon? and now we’re bringing it back for a Dusk Lycanroc special, which includes some new information. So for the unnecessary sake of asking it, who’s that Pokémon? It’s Dusk Lycanroc! 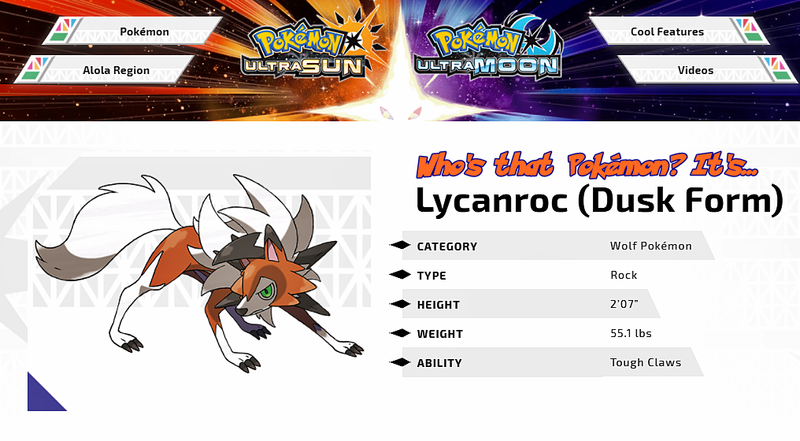 It’s been confirmed that a new form of Lycanroc appears in the world of Pokémon Ultra Sun and Pokémon Ultra Moon known as Dusk Form Lycanroc. The colors of Dusk Form Lycanroc’s body and eyes differ from those of previously discovered Lycanroc, known as Midday Form and Midnight Form. Accelerock is a Rock-type physical move that always goes first. In Pokémon Sun and Pokémon Moon, only Midday Form Lycanroc could learn this move. Midday Form could learn this move when it evolved from Rockruff. Counter is a Fighting-type move that inflicts double the damage received by an opponent’s physical attack. In Pokémon Sun and Pokémon Moon, Midnight Form Lycanroc learned this move when it evolved from Rockruff. Tags: Dusk Lycanroc, Feature, Pokemon Ultra Moon, Pokemon Ultra Sun, Who's That Pokémon? Categorised in: Feature, Nintendo, Pokemon Sun & Moon, Who's That Pokémon?